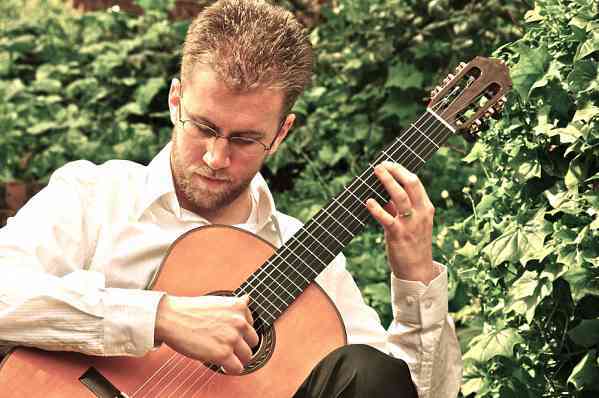 Hailed by Sérgio Assad as “…an expressive guitarist with a great sense of rhythm and tone colors,”Matthew Fish is an accomplished soloist, chamber musician, and teacher. He has participated in numerous competitions throughout the United States and earned top prizes, including First Prize at the Sierra Nevada International Guitar Competition. Matthew has performed throughout California, playing at such venues as the Freight and Salvage in Berkeley, the Davis Arts Center, and the Firehouse Arts Center, and has been a featured artist for the Walnut Creek Guitar Series, the Sierra Nevada Guitar Festival, the Classical Guitar Project in Chico, the Hot Air Music Festival, the South Bay Guitar Society, and the Guitar Foundation of America Regional Symposium in San Francisco. Matthew is a member of the San Francisco Guitar Quartet and has performed and premiered many works dedicated to the group. Recently, the SFGQ premiered "Quartet No. 2," written for electric, steel, and nylon string guitars and mandolin, by composer Garry Eister. In 2010, Matthew was a part of the Doublespeak Project, a collaboration between composers and guitarists to increase the guitar’s repertoire. During this time he worked closely with many composers to create new works that were premiered in a 3 hour-long new music concert. In this concert he was part of a guitar octet written by Kyle Hovatter, and was a featured soloist in David Gottlieb’s "Aventuras", a concerto grosso written for guitar orchestra and four guitar soloists. Matthew received his Bachelor’s of Music Degree from CSU, Chico where he studied with guitarist Tobin Roye. He later went on to the San Francisco Conservatory of Music to study with Latin Grammy award-winning guitarist/composer Sérgio Assad, where he received his Master’s of Music Degree in 2012. He has performed in master classes with some of today’s greatest guitarists, including Zoran Dukic, Judicael Perroy, Marcin Dylla, Ricardo Cobo, Allan Neave, Jeremy Jouve, and Johannes Moller. He holds teaching positions at Silicon Valley Classical Guitar School and Green Octave School of Music. Matthew plays a Kenny Hill Signature Model guitar.